Changes in the way we stand in front of an artwork as if we were standing in front of our own self, creates new formulas and increase, multiply, accelerate the contacts each one of us has with the others. investigate remains;actually, it grows along with everything else.In all fields. a painful silence and a sudden fear of abandonment. Theatre will not switch off. We are what it is made of. And always there will be that Human Culture which it is made of and feeds it. This work, VITA MORTE E RESURREZIONE DI PULCINELLA (Pulcinella’s Life, Death and Resurrection) is not a philological or historical work. It is a work of aesthetics, poetics, and structural analysis on what is nowadays called Commedia dell’Arte. This type of theater is the most concrete, long-lived, structured theatrical genre or system of theatrical genres. The character of Pulcinella provides the powerful aesthetic-poetic, and structural basis for viewing Commedia. In the hardcopy version of my PULCINELLA, the patient reader will notice some insistence on a few concepts. There are two reasons for this. The first one comes from my teaching experience, in which I learned the importance of continuously repeating fundamental concepts and principles. The second is the direct consequence of the sometimes adventurous creative process of writing the book in different times and spaces, including non-traditional spaces such as airports and airplanes, trains, train-stations, hotels, and wherever I was walking by myself. In short, I took advantage of all those very precious, irreplaceable moments and spaces fundamental to writing a book, since 90% of my waking time is spent in social activities. For this reason, when I started to reread my notes, I noticed certain issues of repetition. I resolved most of them, but I didn’t want to resolve them all. Repetita Juve, says my dearest friend and colleague Dottor Arcifanfo Spidocchioni of the Most Noble – or rather Most Asinine – Company of the Brigands of the Packsaddle. I do prefer the classical reading, Repetita Iuvant, but don’t tell Dottor Arcifanfo, otherwise he will start an endless debate. may be happy, disappointed or angry, depending on the critic’s opinion – positive or negative. Artists are always thrilled by a positive review of their performance and get angry or depressed when the reviews are unfavorable. However, they never question whether the description or comment has to do with what was actually performed on stage. It is not that they miss the point, but out of pure human weakness: They only want to know if people liked them, to verify that they were successful. Artists remain astounded when the criticism is incomprehensible, cryptic, indecipherable, and written in a highly specialized language – of the critics of course, not of the actors – because actors never use that language when talking among themselves. They talk in a straightforward, simple, direct, clear, and unambiguous language. For this reason, the critique doesn’t allow them to understand if their performance was good or bad; if people liked it or not; if it was a success or a failure. Finally, artists don’t know what to think when they find out, after reading critique, that they did everything wrong, when instead, they know very well they were successful. The audience showed that very clearly, during the performance and in particular with the huge round of applause at the end. The actors and theatergoers are excluded. Often, the three roles are combined in one person. The language is colorful, very similar to the language used in that theater he was deprecating. In this passage there is enough material to reconstruct a world, a life, a profession. Most likely, Garzoni witnessed bad performances given by one or more low-level companies. The example of zanni Burattino, “whose only gesture is that of putting on his hat” is a case in point. Looking at various historical images, representing different times, companies and artists, and reading many scenarios, we ascertain that doing tricks with the hat was really a typical gesture for zanni. So, Garzoni’s observation confirms that Zanni used to play with his hat. The “critic-historian” Tommaso Garzoni could see that probably that actor wasn’t very good, but the true meaning of the gesture eluded him. That gesture was correct, because it pertained to the character, to the usage and style acquired by everybody involved in that role in that kind of performance. Thanks to an ungenerous observer, we can obtain information, or better yet, a confirmation, of what we thought existed and we can proceed, reassured, with the study of the interpretation of the character. Curiously, the malicious comments of the past can be very useful, while today’s appraisal of the Art analyze it in a way that I, as an actor, don’t really know how to use. With all due respect to the meticulous and in-depth research of the scholars of our time, what the actor does, used to do, and will do on the stage, can be explained only by the actors. It is necessary to be an actor to think like an actor, or it is essential to be among the actors while they prepare shows to present in front of an audience; the ultimate purpose can be summarized in the audience’s enjoyment and the actors’ success. Incredible, eh, that one can say that! Besides, if I, the actor of the 2000s, have to act, let’s say, Shakespeare (just to name one example), or Goldoni (to name another) how do I know how it should be done? Should I try to find an answer in those incomprehensible, maybe inconsistent, methods so fashionable nowadays? What do I understand of how people used to act 300 years ago? Still, I’ve got to know, even though I am going to produce a modern version of what they wrote. Because, I won’t be able to modernize anything if I don’t know everything there is to know about the original piece. And what will people understand in 300 years about how we act today? The director is going to explain that to me? Ouch…! Yes, because the dreadful problem of our time is that the actors are in the directors’ hands. Directors who are trained in that kind of inquiry, analysis and language mentioned earlier. Directors who manipulate the actors at their own pleasure. Bewildered and made to feel guilty actors, unable to use their talent because it is censored and blocked by those directors. Those directors are non-theatrical, as is the case very often with scholars, as scrupulous and dedicated in their research as they may be. carry the true, concrete, human and social truth. They impose it. They affirm it. Always. What happened, in that moment, when some spread the historical blunder of the diabolical Commedia, to the scientific quality, the accuracy, the faultlessness that characterize these people, or better, by which they want to be characterized? They pursued their idea only because they liked it. The need to attribute a “depth” to a genre that embarrasses them, because at base they see it as frivolous and superficial, forced them to come up with an underworld, from which the mask, the one character, and the whole genre derive. The agonizing desire to find depth induced them to look outside and not inside, because, at the end of the day, they are profoundly convinced that there was and there is nothing in it. Can you see something scientific in it? Is there anything scientific when they use tons of paper, ink and megabytes to explain the etymology of ‘Arlecchino’? That wretched name, only one among the hundred, the thousands of names for zanni in the Commedia to lend itself to such exercises? And what about all the others – many – names of the other characters? How many and which ones are the names for the Old men? How many and which ones are the names for the Lovers? And for the Captains? At the end, there are thousands of them. Every name is a story, a meaning, so it is a behavior. Do they count for nothing? Only one is interesting? The only one who can be referred to (forcefully) as a little devil is the one who explains the whole system? Really? One name. Only one name and all Commedia dell’Arte is wiped out for the benefit of one character and for the evocation of a fantastic world that has nothing, absolutely nothing to do with Commedia dell’Arte. In particular and, above all, it has absolutely no bearing on its birth, its origin, with the moment in which it appears, secular and of the renaissance, urbane and concrete. It declares everything about itself and its future. Even that baroque and degenerate future that throws everything in, including some moralist devils imported from abroad, the gods and goddesses of the Olympus and various other creatures. It throws in everything as if it were a large and welcoming landfill. But it can’t ruin the Commedia because all the set characters are able to resist to it. To the bone they are secular, urbane, down to earth, of the renaissance. Sometimes, in the long history of Commedia dell’Arte we find disconcerting moments of dumbness4 or superficiality or low pretentiousness; but rest assured no one should think that here we are thinking that you think that we think that centuries of activities of thousands of companies and actors could always be at their best, the epitome of perfection and that they never made mistakes or never let themselves do things the easy way. In this sense, there really is everything in Commedia. Commedia that continues also, if not especially, in its careless aspects. This way, the historical continuity of the detraction is guaranteed. Detraction that, with the passing of the time, becomes more elegant and scientific. One point on which historiography and theatrical criticism agree, with varying emphases and intensity, is the assumed lack of structure in Commedia dell’Arte’s works, scenario, and written comedies. Sure, it takes a lot of hubris to affirm a concept so anti-scientific. Let’s be clear: everything that is made, manufactured, even a drawing done with markers or clay modeled by children, has a precise structure. If a single work of art (Michelangelo’s David, just to name one) has a well-defined structure, imagine a work of art that has been repeated, shared, polished, and refined in thousands of experiences and for several centuries. I believe that the refusal to see a precise structure in an artistic system that created a profession and taught it to everybody, a system that has consistently held up for centuries and still persists, is the legacy of the embarrassment felt in the last century. Embarrassment that forced the historians of that wrong-headed century, still influential now, to invent the diabolical genealogy for the Masks of Commedia dell’Arte. They think and their descendants continue to think (we are in the third generation) that Improvvisa is a small thing, a little thing, a tiny, inconsequential thing. However, this refusal is not caused by a profound and undisguised contempt. No. It is something much more embarrassing. It is their inability to see the structure. Why can’t they see it? Because you can see it only if you perform Commedia. Do they do it? Could they do it? No and no. Not all the actors can explain the Commedia’s structure, but all of them can understand it and put it into practice. 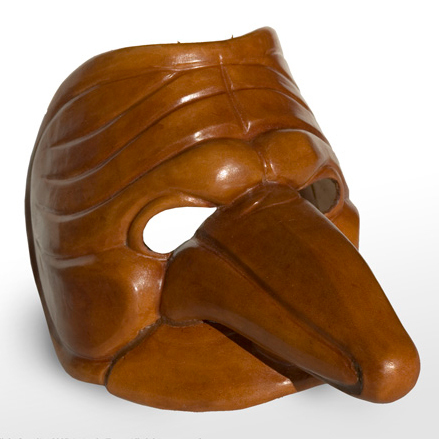 In my work, through the great mask of Pulcinella, I will talk of the poetic and aesthetic essence of Commedia. I will talk of the technique and how-to-act, that is, physically, the structure of the Commedia. The structure is nothing more than how the play is made and how it is possible to recreate it. It is on the earth’s surface; it is neither heavenly nor chthonic. It is not even in the dark depths of the psyche. Instead, it lies in the direct relationship between people, between social human beings. In two ways: in the situations presented on the stage and in the play given by the actors to the audience. My intention is to help bring clarity and order to all the confusion created by those who mistakenly believed they were bringing order. I started with the previous work, THE COMIC MASK IN THE COMMEDIA DELL’ARTE. In that book I explained the structure of Commedia. For the first time. Many comic actors are benefitting from it. In VITA MORTE E RESSURREZIONE DI PULCINELLA I talk about Commedia through the great character Pulcinella. Why did I choose to do so? Because Pulcinella is the only character who has never experienced any historical interruption. Pulcinella is the guarantee of the historical continuity of the Improvvisa. During the Romantic period, when Commedia dell’Arte disappeared, Pulcinella remained, keeping it alive. Pulcinella, who was only a part of Commedia dell’Arte, succeeded in regenerating it and rebuilding it as a whole. Pulcinella, the Great Survivor, kept an entire world alive. And Pulcinella is human. Very human. Nowadays, false ideas are circulating about Pulcinella. It is believed that he is malignant and evil. Evidently, the influence of the “devilish” theories has come this far, to contaminate a character who is the ultimate expression of humans as social beings. As such, he is exposed to all, absolutely all, possible daily dramas, predicaments, entanglements, and always as a victim, because Pulcinella is a “chicken”6 (his name comes from “pulcino,” a chick), a fool, a blockhead, exactly because he is profoundly good. The exact and perfect contrast to the meandering theories about an evil Pulcinella (but who invented such a great blunder? Do they have names? Who disseminates this absolute nonsense without any artistic-historical foundation? Speak up if you know!). My contributing effort will continue, soon after this work on Pulcinella, with even more material for reflection, explanation, and demonstration. I don’t have a title in mind yet for my next publication, on which I am already working. It will develop, amplify, update, and enrich the first one. One thing is certain, quite certain, for me and for those who think like me: The current explosion (which seems an implosion, since it is confined to social networks, unleashed on the streets from time to time, but definitely absent from theaters) of a certain would-be Commedia, superficial, formless or a mix of forms, quickly diffused, seems to verify the hyper scientific historiography and critique. The paradox is only apparent, because that historiography and critique, trying to explain who knows what, has demonstrated anything. For this reason it legitimizes the overabundance of hammy wannabe artists who do whatever they want to do, whatever comes into their minds, because “after all, Commedia is whatever you want it to be.” In the face of the inventors of the Art, that is, literally, in the face of Professionalism. Actors are almost never able to explain what they do. This is what people think. Unfortunately, it is very true. However, compared to that “almost” that means someone can do it7, there is the terrible reality of those historian-critics who are NEVER able to do8 what they strive to explain. We don’t want to preclude anyone’s freedom to express and divulge their thoughts (let them do it; it’s all gravy), but we would like them to be less of an exclusive caste. They should listen, pay attention, and recognize also our “theoretical” work. In fact, this work develops over time, it is formulated ’a ​​posteriori’, comes from practice, what is well done as well as what is not so well done. Practice that is precisely the object of any study on theater. It is experience. It is evidence. Precious things in these times, in which we are rapidly moving toward the extinction of all kinds of art and historical culture. 2. Life, Death and Resurrection of Pulcinella. 3. Tommaso Garzoni, La piazza universale di tutte le professioni del mondo, Venice, 1589. 4. Gnoccaggine (dumbness), facility, ease. Gnocco 1: Typical bread flavored with ciccioli [food prepared from pig fat: translator’s note] the region of Reggio. Gnocca 1: Simpleton, silly person. Naïve. Gnocca 2: A beautiful and desirable woman. 5. Arlecchino is one of the many names for zanni II in Commedia dell’Arte. He is not a unique character, but he is one variation, among the others, of one specific comic type in Commedia dell’Arte. It is typical in Commedia to have many names for the few comic types. The Old man can be Magnifico or Dottore; the Servant has two variants: First and Second, Clever and Foolish; the Lovers come in pairs, multiple pairs in many plays; the Captain. There is nothing else. Other characters are only momentary, useful for a precise action or in a certain specific comedy. For this reason, they cannot be counted in the privileged group of the “set types” or indispensable characters. However, even if the set types are just a few, their names are countless. Why? For the obvious reason that if on the one hand there is the actor who continues the family tradition or the Maestro of great fame, on the other hand there are the majority of the actors who invent their names and their maschema [typical details of a character]. They remain in the Tradition, but with a personal touch. Arlecchino is only one of the many names given to the foolish servant. Also, let’s add that many zanni II, with different names, look identical, with the same colorful patched costume (later with elegant diamond shapes), the same cap, the same dark face, generally with a flat nose. The myth was born at the table, better yet, at the writing-desk: The first theories about the mask-devil appear in the 1950s. Everyone talks about the mask-devil as if it were real. However, no one will cast it as a character on stage because it is simply alien to the genre and thus not usable. The only concrete and disgraceful effect that comes from it is the ‘protagonism’, in that variation that is literally infesting: Commedia, ladies and gentlemen, doesn’t have ONE protagonist, for the simple reason that all the characters are protagonists. The Companies of the Art created a system in which all the specialists, the maestri were equal. There were only two requirements for everybody: to be good actors and make the audience happy. 6. In Italian “pollo” (chicken) means simpleton. [translator’s note]. 7. Among the actors who have succeeded in explaining what they do: Massimo Troiano, Discorsi delli triomfi, apparati e delle cose più notabili, fatte nelle sontuose nozze dell’Illustrissimo et Eccellentissimo signor duca Guglielmo, primo genito del generosissimo Alberto Quinto, conte palatino del Reno e duca della Baviera alta e bassa, nell’anno 1568, a’ 22 di febraro, by Massimo Troiano from Naples, Musician of the Illustious and Most Excellent Duke of Bavaria. In Monaco, published by Adamo Montano, MDLXVIII. Flaminio Scala, Prologo della comedia del Finto Marito, in Venice, published by Andrea Baba, 1618 (1619); Il Teatro delle Favole Rappresentative, overo La Ricreatione Comica, Boscareccia, e Tragica: divisa in cinquanta giornate. In Venice, published by Gio:Battista Pulciani. MCDXI. Pier Maria Cecchini, nobleman from Ferrara, known as Frittellino among the comedians, Frutti delle moderne comedie et avisi a chi le recita, Padua, 1628. Nicolò Barbieri, La Supplica Discorso Famigliare di Nicolò Barbieri detto Beltrame diretta a quelli che scrivendo ò parlando trattano de Comici trascurando i meriti delle azzioni virtuose. Lettura per quei galantuomini che non sono in tutto critici, ne affatto balordi. In Venezia con licenza de’ Superiori e Privilegio per Marco Ginammi Lanno MDCXXXIV. Luigi Riccoboni, Histoire du Théâtre Italien, A Paris, De l’Imprimerie de PIERRE DELORMEL, 1728. 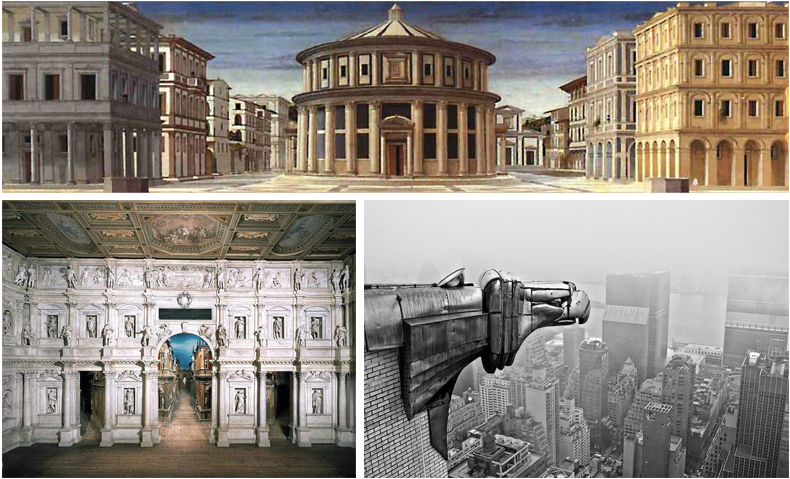 Antonio Piazza, Il Teatro ovvero fatti di una Veneziana che lo fanno conoscere, in Venice 1777. Le mime Séverin, L’Homme Blanc, souvenir d’un Pierrot, Plon, Paris, 1929. Dario Fo, Manuale minimo dell’attore, Giulio Einaudi Editore, Turin, 1987. Antonio Fava, La Maschera Comica … cit. Maschera & Maschere, exhibition catalog. Les masque Comiques d’Antonio Fava, par THEATRUM COMICUM, Geneva, 2010. Vita Morte e Resurrezione di Pulcinella, ArscomicA, Reggio Emilia, 2014. Along with other, more important names. In any case, this is still a small sampling of from an extensive number of actors. The Long Renaissance is my field of work, which takes constant effort, both professionally and mentally. This term refer to the historical period between the thirteenth and the eighteenth centuries; however, Renaissance is more commonly understood as the time between the fifteenth and sixteenth centuries, when ’modernity’ began: as a school of thought, as a research method, as a vision of the world. 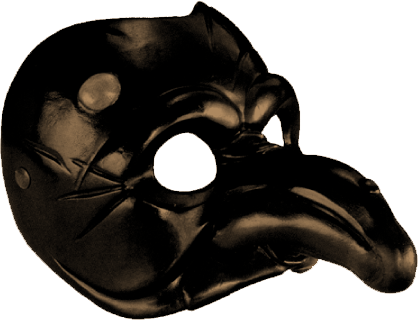 At the end of the fifteen century, along with the humanist movement of that period, we see the beginning of modern theatre (Humanist Comedy), followed by Professionalism in the thirties of the sixteenth century: Commedia dell’Arte was born. Well, this is the key perspective to this world, this culture, through the theatrical disciplines born in that period, which are offered, researched, taught and produced today: that of a long, very Long Renaissance. Personally, I do believe that Renaissance is still alive. Today’s theatrical culture has a tendency to split into ’genres’ what, during the Renaissance, was the compulsory combination of essential components: even the crudest realism had to imply a touch of ’absurdity’; my aim is to combine once again what has been conceptually split, with the pleasure and wisdom we inherit from that extraordinary period. Commedia dell’Arte, Humanist Commedia first, gradually followed by the Baroque and the Commedia in the Age of Enlightenment, is theatre. Pure, simply pure, theatre. It is the realm of the actor, there to serve his one and only master: the audience. ANTONIO FAVA is an actor, author, theatre director, Maestro of Commedia dell’Arte and of Comedy. He directs the Scuola Internazionale dell’Attore Comico – SIAC (International School of the Comic Actor) in Reggio Emilia, Italy. He designs and makes leather masks for use in his School and performances. He teaches Commedia dell’Arte in schools, universities and drama academies throughout the world. His masks are on show in important museums and cultural institutions. He is an international director. He is also author of the book entitled La Maschera Comica nella Commedia dell’Arte, published by Andromeda, English version, The Comic Mask in the Commedia dell’Arte, published by Northwestern University Press. Zanni, Zani, Zane, Zan, Zuane, Zuan, Zagno, Zanin, Zuanin… Giovanni, Gianni, Juan, Joan, Joaõ, John, Jean, Hans… e then Zagna, Zana, Zuana, Zuanina… the name of all the people in on name only. Other interpretations of the origin of the name are forced or fantastical for example that one that makes Zanni derive from sannio, one of the Latin synonyms of histrio, buffoon, fool, comic. In the speech of regions south of the Emilian-Tuscan Appennines, the name is clearly pronounced: Gianni and Gian, which are diminutives of Giovanni. The alpine-Paduan “Z” gives a dialectal pronunciation to the name but changes neither its roots nor its meaning. The name Zanni is the given name of a Commedia dell’Arte servant, historically the first of the Commedia characters, when it was performed with small groups of similar characters that were all similar in appearance, mask, behavior, and name. “Zan” was a sort of prefix before all their names, followed by the name that characterized the individual: Zan Salciccia, Zan Fritello, Zan Tabacco, and so on. Each actor invented his own. is the original form of Commedia dell’Arte, characterized by these very characters, who exaggerated the social types well known to the audience, the mountain people who had immigrated into the cities in search of work, shelter, food. With the evolution of this form, due primarily to the introduction of the actress, the woman on stage, the elementary dramaturgy grows more complex, becoming comedy in the classic sense, and the various Zan become fixed as servants of various masters. By extension, used as a noun, zanni signifies a generic servant, the character of the servant in Commedia, any servant. 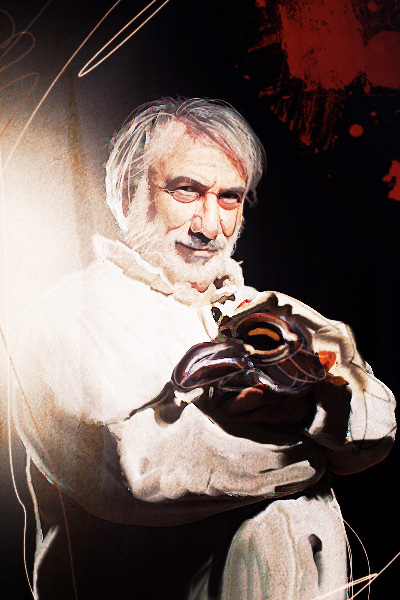 The given name Zanni is thus used in plays when there is no more than one of the type, since no two Commedia characters can have the same name in a single story. The noun zanni is a technical term not used in performance. A master, for example, never calls for “his zanni”, but rather for “his servant”; if his servant happens to be named Zanni, then Pantalone calls for Zanni. An actor can play “a zanni” and this ‘zanni’ might be named Zanni or some other name. On stage therefore, we may have “many zanni”, who might be named Zanni, Brighella, Franceschina, Truffaldino, or Zan Trivella, Zan Farina, Zagna, Zan Tager, all interpreted by different actors, each a specialist in his own zanni. and keeps himself warm in that new setting, giving up his great passions of the past – except in exceptional cases, such as that of Antonio Petito – to become a marginal figure who tosses in occasional witty observations from the side of the stage. But this great Mask finds his outlet in popular festivals. In Calabria, the tradition of Pulcinella is decidedly freer and more articulated: every festival has its Pulcinella, who acts as a solo actor – narrator – storyteller – entertainer – acrobat – magician – juggler, as well as functioning as a sort of overall director of the entire festival. Today, Pulcinella has perhaps too much history to be able to be described in a single way. Like Pirandello’s famous character, he is one, nobody, and a hundred thousand. Whoever he may be, he is always the comic symbol of the urgency of survival pure and simple. That’s what makes him stand for everyone; he couldn’t make it on his own. and he can be “Pep” and something more if we make him Catalan, or a “Mc” and something more if we make him Scottish. And so on and so forth, without any change in his character, behavior, or function. The most famous and historically most common Magnifico is the Venetian one, Pantalone. The name is probably a contraction of “pianta il leone”, he who plants the lion, the symbol of the Venetian Republic. Venetian merchants “planted the lion” in southern and Mediterranean markets, they conquered the world by opening plants and dominating local economies. Our Pantalone, therefore, is a Venetian merchant, a perfect example of the shrewd, cunning, vulgar, and proud dynamism of the refined, opulent, and marvelous city-state. The “Oxonian Pantalone” was created for Love is a Drug with the Oxford Stage Company, 1995. Gratiano is the most ancient of the given names of the Doctor. The forehead of this mask is “astronomical”; the lumps are laid out in the form of a constellation, symbolizing universal thought and consciousness. A classic Bologna-dialect Doctor with multilinguistic layers. Great expert in everything, “Grand Old Man,” father of one of the two lovers, friend-enemy of Magnifico, with whom he is in eternal conflict-complicity. This mask has the most reduced structure: just forehead and nose. The forehead is indispensable as a symbol of genius, the nose as the comic center of the face. or terribly distracted by the great joys and suffering (the lovers) to notice his blunders. The audience immediately recognizes him for what he is, shameless and pompous. But he is truly, truly great in one thing: gastronomy. There, he excels. He goes into exaltation, he becomes deeply moved, he slobbers all over himself while describing the recipe, for instance, of the real lasagna, and he is scandalized, indignant, furious when reporting barbarous variations or ignoble practices. The Doctor is the projection of the aspirations of an entire starving population that sees in him, in his immense gut, his fat pronunciation, his language that explosively re-invents all languages, and his intestinal outbursts, as overflowing as his gestures, the realization of their most gluttonous, prohibited internal desires. Colui che mette paura, che spaventa il nemico. Per esteso, nella versione di Francesco Andreini, si chiama Capitano Spaventa da Valle Inferna. Il Capitano, in Commedia, è il guerriero, il bravaccio, il mercenario, l’uomo d’arme. Gran combattente e grande amatore, è un eroe su ambo i fronti. Solitario, per motivi sia comico-poetici che funzionali. Fa coppia comica col suo servo, quando ce l’ha. È straniero, viene da lontano, ha visto tutto il mondo, vi ha visto cose che nessun altro può aver visto e vi ha fatto cose che nessun altro può aver fatto. Parla la sua lingua di straniero sospettosamente mescolata con quella del luogo (ossia, del pubblico). Naturalmente è un fanfarone, è il fanfarone per eccellenza; millantatore di straordinarie avventure, prodezze e prestazioni eroiche ed erotiche. In realtà è un semplice ed un codardo. Ma questa terribile realtà, della quale lui ha vago ed inquieto sentore, va assolutamente tenuta nascosta. Esaspera la sua immagine virile e vincente per trarne vantaggi e soddisfazioni, ma forse soprattutto per nascondere l’intima verità, che lo fa soffrire terribilmente. È molto attuale, “nostro”, il Capitano. Ai tempi della Commedia storica tutti i suoi problemi relazionali si riassumevano in una parole: onore. Oggi la questione può apparirci risolta da parecchio tempo, ma non è cosí. Alcuni passaggi ci portano alla ridefinizione nostra: dall’onore al decoro, da questo alla dignità ed infine l’ “immagine”; è evidente che l’immagine ci concerne ed è altresí evidente che l’immagine è l’aggiornamento dell’onore. Il Capitano ha sempre avuto un problema di immagine. C’è dentro fino al collo in quel terribile problema. Tutto il suo essere si muove nella direzione di dare di sé quell’immagine gloriosa e grandiosa senza la quale è finito, fallito, inesistente, morto. Ogni tentativo di imporre la sua immagine di sé costituisce un passo verso il disastro. Al suo primo apparire in scena il Capitano impressiona realmente gli altri personaggi, ma, ahilui, non regge la lunga durata e scivola fatalmente e rovinosamente verso la piú fangosa vergogna, fino alle legnate ed alla fuga finali. L’interprete del Capitano fornisce immediatamente al pubblico tutti i segnali comici che significano il destino del personaggio. Eppure, il Capitano gode di due straordinarie chances: è un grande affabulatore, le sue storie, benché pure millanterie, affascinano tutti, la sua visionarietà “utile” – utile alla sua sopravvivenza fisica e di immagine – è realmente grande, grandiosa. Il Capitano non ha cultura, ma ha orecchio, cosí che una narrazione “da bar” si arricchisce di citazioni (dubbie) e di riferimenti culturali (incerti), preferibilmente di carattere mitologico. Il Capitano che ‘fa una bravura’ è un bellissimo esempio di teatro pensato per tutto il pubblico, tutti i livelli di comprensione e gradimento. Infatti la sua dimensione di eroe da taverna lo avvicina al pubblico equivalente, ma i contenuti di cultura sapientemente “orecchiata”, alzano via via il livello, fino ad imporsi ai palati piú fini. In questo senso, il Capitano è come dovrebbe essere – a nostro avviso – il teatro, tutto il teatro: chiaro, popolare (ossia, per tutti), divertente, raffinato; ed anche “problematico”, come lo è il Capitano. Il Grande Affabulatore ha dunque questa dimensione dalla sua; ma anche un’altra: è un grande amatore. L’animale uomo di sesso maschile non falla. Delle sue doti amatorie ne gioisce – oltre a lui stesso – soprattutto la sua referente ed equivalente femminile, la Seconda Donna, o Signora, giovane, bella, spavalda, fanfarona come lui (ma non codarda, anzi, piuttosto aggressiva), moglie dell’irrimediabilmente, costituzionalmente cornuto Magnifico, oppure (che è lo stesso) Dottore. Va da sé che la Signora, sposando un vecchio, ha sposato il suo capitale, che ama tanto e del quale ostenta gli effetto, sviluppando lei il tema dello status con egual poetica e tematica del capitano in rapporto all’eroismo: entrambi hanno un problema di immagine. Con la sua funzione di “intruso”, di “terzo incomodo”, il Capitano si porta addosso il marchio della colpevolezza ed il destino dello “smascheramento”. Si riavrà dallo svergognamento e dalla bastonatura finali quel tanto che basta per preparare un’uscita di scena durante la quale darà fondo alla sua mitomania che gli farà immaginare, terapeuticamente, un futuro di ben piú grandi glorie e trionfi. Androgino è maschera sia maschile che femminile. Maschera sociale, accessorio personale da mettere e togliere, usata dai personaggi “belli”: Innamorato (I° amoroso), Innamorata (Iª amorosa), Signora (IIª amorosa), Capitano non mascherato (II° amoroso). L’Androgino è maschera di dissimulazione e serve a nascondere il volto per non farsi riconoscere: si usa in situazioni imbarazzanti, in clandestinità, in azioni segrete, o semplicemente per non essere costretti al rapporto con altri. La Commedia dell’Arte non rappresentava solo commedie, solo teatro comico. Una parte del repertorio era di natura poetica: commedia pastorale, marinaresca, boschereccia. Facevano la loro apparizione personaggi mitologici, come satiri e ninfe, tritoni e sirene. Aggiustati ad uso e consumo di un rapporto attore-pubblico molto diretto, questi personaggi partecipavano agli intrighi amorosi e zanneschi della commedia propriamente detta. Il Satiro “gran cornuto” è cosí chiamato per evidentissime ragioni. Questa maschera contiene elementi classicheggianti ma anche medievaleggianti, essendo vista dal pubblico piú come diavolo che come satiro. Nel nostro lavoro, in allestimenti come nella scuola di teatro comico, le maschere dei satiri vengono studiate come esseri significanti le forze della natura ed agenti sempre e comunque: anche lo stato di immobilità rimanda a certi immobilismi sia naturali che sociali, coi quali i personaggi si trovano a dover fare i conti. Il nostro satiro non parla, ma emette suoni molto espressivi e significativi. In its early stages, Commedia dell’Arte used to be known as Comme Zannesca, Commedia Improvvisa, Commedia Mercenaria (mercenaria= paid = professional), Commedia Italiana. There have been several other classifications, however, all together, they outline the most important meanings: Zannesca = popular; Arte, Mercenaria = professional; Improvvisa=improvised, directed by actors; Italiana= origin, style, rhythm. All this together creates a genre. not even today; Commedia dell’Arte organises the location, the settings, the audience; even the payment system thanks to the invention of the ’ticket’, which originally was the simple rental of a chair. Commedia dell’Arte talks about real people in real situations in a very spectacular manner: it is the Big Show of the collective truth, of us all. By Commedia dell’Arte we usually mean comedy.However, ’Commedia dell’Arte’ is rather a summarising expression of a production system that combines different genres: comedy and poetry as in the Pastoral Comedy, in the Boschereccia, Marinaresca and Piscatoria ones; epic in Opera Eroica; tragedy in Opera Regia. Commedia dell’Arte invented the modern professional theatre. It disappeared long time ago, when the Roman Empire, that was embracing Christianity, fell into a sort of religious-cultural revolution, which erased all that was entertainment and the concept of show itself. There is an ’empty time’, which reduced to its lowest terms by prolonging the agony of the Roman professional theatre and by going back to the very early origin of the Commedia, goes from 400 A.D. to 1530. During these thousand hundred thirty years, professional theatre did not exist; all memories about it were lost and so was the concept. Theatre itself made sporadic appearances, only to be “reinvented” as an extension of the official liturgy for religious purposes. There were also secular forms of comedy of course; farce among all genres. The term ’Mercenary’, ’Zannesca’, ’Improvised’, ’Italian’ or ’dell’Arte’ – which all precede the word ’Commedia’ that stands for ’Theatre’ – represents a new starting point for professional acting, a permanent one, which invented the actor and the actress as well; figures that both spend their lives trying to get their Audience to laugh (yes: ENTERTAINING!). Modern professional theatre was invented without any expectations of being “supported” – nowadays “funded” – by whatsoever institution. They were simply asking for money. They were selling a product/service and they were asking to get paid for it. Today things are terribly different: however, that was and remains the only principle that can guarantee continuity of the project, its existence, its survival. enjoying a well-crafted story, performed by a great and highly skilled theatre company. Intervals were filled with songs and dances by the very same actors, which were also selling products of all kinds, just to earn some extra money. With very few exceptions, art has never turned any of its most devoted promulgators into a millionaire. However, the versatility of the actors allowed them to produce a lot, anything, always, constantly and tirelessly: they produced Art, Craft, Culture; and by doing so they were able to support themselves. By constantly producing and selling great, beautiful, respectable products, Commedia dell’Arte actors have marked a significant part of European societies for at least three centuries.